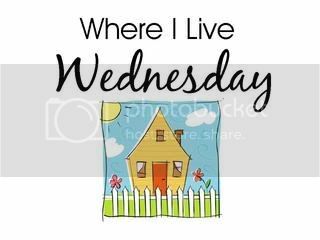 Jenna, over at The Hamlett Daily Dose hosts a home decor feature every Wednesday. I love personal home decor so I wanted to join in and support her blog. Our Master Bedroom is still pretty much a work in progress as you can see from the pictures below. Our nightstands have been recently purchased from WalMart and are a part of their new Canopy furniture collection. My plan is to purchase the rest of the Canopy Bedroom Set and replace the dressers that we inherited from Jeff's Grandma. The curtain rods are not exactly what I had in mind and are actually quite flimsy. I am hoping to raise and replace them with sturdier rods. I would also like to put chocolate colored valances in the master bath along with new matching towels and bath mat. It will come together eventually and I like what we have done so far. The paint color of the Master Bedroom is Sherwin Williams Nomadic Desert and the Master Bath is the Sherwin Williams color match of Restoration Hardware's Silver Sage. Yes, there are a few pictures with and without curtains, as you can see I was mid assembly during the picture taking process! Your Master bedroom and bath is beautiful!! Your bed looks so comfy! We painted both our bathrooms(the master and the guest) Sherwin Williams Nomadic Desert. The rest of the main part of our house is the shade darker in Latte. We still have to paint our master room, that is next. Love Sherwin Williams!!! I love your master bedroom! I absolutely love your bed!